As a kid, the purchase of a tennis racquet was a luxury for me. It still is something I do not take for granted. 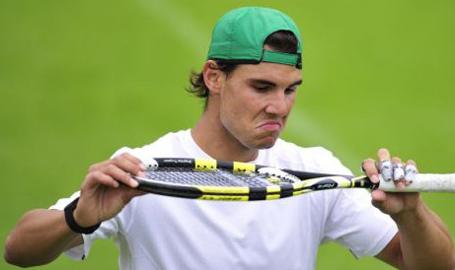 I am saddened when I see pros smash their racquets. I am particularly distressed to see such a public display of violence. This abusive behavior seems to be gender neutral -- today it was Sloane Stephens at the Miami Open. Why should we respect players with such disrespect for the tools of their trade and their fans, including kids who admire them. Is the rationale that they get their racquets for free? Why should that matter? Is it a sense of entitlement? Why should anyone buy a racquet that is so easily broken? Why would a racquet manufacturer want a player to use their racquet brand if it is blamed for the player's failing? Is a record kept of such tantrum throwers -- perhaps season/career warnings for racquet abuse -- although chair umpires may not be a reliable guide. Maybe tennis tournaments/TV broadcasters can give tournament watchers warnings, like "RS" for a "Racquet Smasher." More importantly, who are the good citizens? That is, which players can best serve as role models for my daughters? Great post. I am of the same belief too. Its not display of public violence per se but I believe that one should not destroy the tools that put food on his plate. They are to be respected. This is why i cannot relate when they say Djokovic came from a war ravaged nation fighting for survival yet breaking rackets every tournament. You do once in a while to vent out it is ok . But some players do it in inconsequential matches and that seems ridiculous. Glad I shared the thoughts. Perhaps surprisingly, the primary term used in the ATP definition of Racquet ... Abuse is "violently." I imagine that the force needed to break a modern racquet may be considered violent per se. And if I see it at a tournament live or on TV it is public. Nadal clearly wants to win and doesn't need to abuse racquets to convince us. Thank you. Other examples, especially among the top players? I've never seen Khachanov smash his rackets, though perhaps I haven't watched him enough. I saw him come close to doing it in the US Open against Rafa but he stopped himself. Seems like a good guy though. To be fair, I didn't have a lot of money growing up and still smashed a racket. Sometimes it's just an anger problem. I do agree about choosing a better role model than a racket smasher. Maybe one who smashes rarely could be considered? Thank you. I'll try to watch Khachanov more. If true it would be especially encouraging that one can learn anger management -- even if (according to his Wikipedia entry) his tennis idol was Safin, who had (as noted above) a reputation (apparently well-deserved) for racquet abuse. I've seen Karen smash his racquet few times, against Lu at Auckland one year and at Hamburg against Delbonis as well. Think you'd be hard pressed to find a player who hasn't smashed at least one racquet. Dang it. I think Rafa is definitely the best answer. He's probably the least likely to ever smash his rackets again. 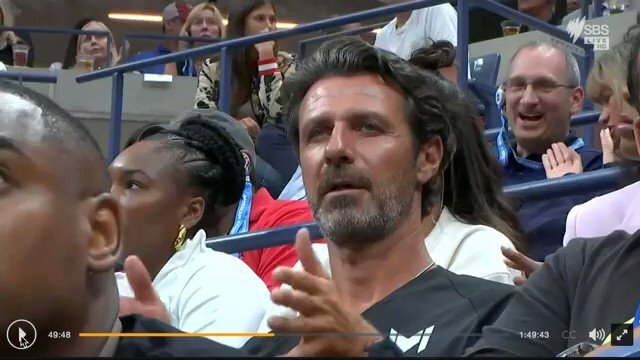 I'm trying to think if I've seen Gilles smash a racquet, nothing is coming to mind right now, he's thrown it, smacked the net, and whatnot.. I've seen Karen smash his racquet few times,.. This model Soviet Bot had a recent firmware update to provide functionality for a "public display of violence against a tennis racket," which may explain the discrepancy. Release notes should have been provided with the firmware download. Please contact your Kremlin representative for additional information. Rafa by consensus? And among the women? Maybe Federer can also be a great example in a way? He has smashed many rackets, but mostly when he was younger, as far as I know. I've seen him do it after becoming a grand slam champion, but I don't think it's too often. He is a great example of someone who learned to control his anger. He also respects the crowd to a great degree. Maybe because everyone loves him haha. Interestingly, a quick search shows a number of players have smashed racquets playing Simon, but none of him smashing his racquet. I imagine that nowadays so many videos are taken that there's a chance that anyone's "bad deeds" are posted. Indeed it may be easier -- including for Federer -- to be a gracious winner than a gracious loser. He had a personal tragedy that caused him to take everything more seriously. And then he started winning more than ever. This could be a great example for your daughters. It's a small part of the article, even though the title may indicate otherwise. Routinely smashing a tennis racquet is the equivalent of a child throwing a temper tantrum. But, hey, it's a healthy way to express yourself...right? Sharapova doesnt racquet smash. Has great self control and focus during a match, unlike Serena. You do have a point with Federer being a bit of a gracious winner more than a gracious loser. But, the part about Peter Carter in this video is deep. Though, he says all the tantrums may have been good for him at the end so maybe you don't want to follow his lead if you don't want your daughter ever breaking rackets haha. A temper tantrum may be normal (healthy?) for a two year old. Sharapova seems to have routines/rituals that help her to focus her energy -- thanks for mentioning her. Perhaps Andreescu has mental practices that help her to excel without temper tantrums? Thank you for the video -- I will watch it. I do think that he went through a difficult losing patch a number of years ago that he found difficult to cope with. I don't recall whether he took it out on his racquets. I definitely saw a video of Federer after being a multiple grand slam winner smash a racket and get booed by the crowd a bit. Perhaps it was during that losing patch. Not sure how often things like that have happened. I certainly have seen "adults" throw tantrums and assert their "freedom of speech" or that they were only joking. Thank you for assuring me that we have a similar sense of mature behavior. I've said for a while now there should be a big foam 'anger wall' somewhere near the court where a pro can smash the racquet into it as much as he/she wants, then donate the perfectly fine, $300 in a store racquet to charity. Well, you certainly don't become a war ravaged nation by not breaking things. They did breaks racquets, but very rarely. I find it interesting how Venus is always calm and collected on court and never smashes her racquet yet her sister is a ticking time bomb who obliterates her racket every 3 matches. Ironically, I smash my plate during a bad meal, and then eat off my racquet. I'm not a fan of racquet smashing, but it's never bothered me that much, if that's the only breech of sportsmanship. To slightly discourage it, how about forcing a player to play with the (intentionally) smashed racquet till the next changeover or till the end of the set? Federer is my hero. It’s incredible, even when smashing a racquet he does it with so much style, class and grace. I can't recall seing Feliciano Lopez smashing a racquet. You forgot efficiency. He totalled that frame in one try. Not the weak attempts at breaking you see from various madies. Maybe they should open positions for ushers at the tennis tournaments that announce the players as they enter the premises with loud "Beware of the racquet smasher! Racquet smasher on site!" A sort of a tennis version of a Dickensian pickpocket thieves warning. Thanks! Not too shabby a list. Apparently it's possible to be both a good sportsperson and a winner. Borg has never done it either.